Award-winning Santa Rosa Beach artist Kathleen Broaderick will be offering a two-day oil workshop at the Boca Grande Art Center this month. An intensive two-day “Bold & Beautiful Oils” workshop is set for February 26 and 27 from 9:30 a.m. to 3:30 p.m. Broaderick will teach creating clean, beautiful paintings in oil. Kathleen will start the first day by painting from a photograph of a seagull, and students will follow along step by step. As they paint, students will enjoy exclusive one-on-one painting tips, advice and guidance from Broaderick. Space is limited and will sell out. Reservations are required. A supply list will be provided to each registered student. The registration is $325 per person. As a former elementary art teacher, Florida native Kathleen Broaderick is perfectly suited to lead classes for art lovers of all skill levels. Her artistic journey began serendipitously during her last semester at Florida State University, when she filled an open slot in her schedule with a watercolor class. After raising two children and teaching elementary school, she turned her longtime passion into a career. Her love of watercolor is evident in the transparent luminosity of her energetic, layered oil paintings. Broaderick deftly captures the essence of her subjects with bold use of clean color and light created with loose brushstrokes resulting in fresh, relatable pieces. As the 2016 Poster Art Contest winner, Broaderick’s artwork prominently represented the Mattie Kelly Arts Foundation’s Festival of the Arts in Destin. The same year, she also won an Award of Merit in the 21st annual juried art competition. In June 2017, she designed and opened CHROMA Studio & Gallery on 30A. In August 2017, she was named an exclusive artist for Ballard Designs, one of the nation’s premier sources for home furnishings. 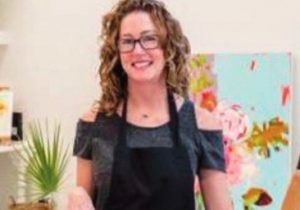 In October she was named South Walton Artist of the Year for 2018. To register, visit bocagrandeartcenter.org or call 964-1700. For the latest updates on new news and art offerings, sign up for CHROMA e-news on CHROMA30a.com, and follow Kathleen Broaderick on Facebook and Instagram.